This is a complete Pearl Harbor experience. From A to Z everything is included. Your airline ticket, your round trip transfers from Honolulu international airport to Pearl Harbor and back, all admission tickets to : USS Arizona Memorial, USS Missouri battleship, USS Bowfin submarine and aviation museum not only included but you also no need to arrive at early morning and stay in a long USS Arizona Memorial ticket for hours and behind thousands. Your breakfast and pearl harbor lunch is also included in this package. Arrive at least 1.5 hours prior to your flight's departure to Oahu. You will fly out of the inter-island terminal and be greeted by a representative on arrival in Honolulu. After a brief orientation you are provided with tickets to the attractions at Pearl Harbor. Stop by the Road to War museums, the Pacific Aviation Museum, visit USS Missouri battleship and enter to USS Bowfin submarine and submarine museum. Explore Visitor Center Pearl Harbor and watch actual film footage of the 1941 Japanese attack on Pearl Harbor. 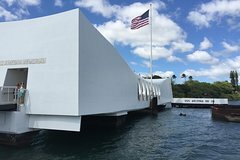 Once you're transferred by boat to the USS Arizona Memorial, there's no need to wait in line. Simply use your priority admission to explore this top Hawaii destination at your own pace. After fast-track entry and an audio tour, eat a hot dog lunch with soup, served in front of the USS Bowfin submarine. Take a self-guided audio tour of the submarine and receive a pass and audio set to its museum. Use another pass to transfer to Ford Island for a look at the USS Missouri Battleship, and visit the USS Oklahoma Memorial. Your driver will pick you up for a brief Honolulu city tour before heading back to the airport, if time permits. Your driver points out historical landmarks such as the King Kamehameha Statue, Iolani Palace, Hawaii State Capital, Washington Place, the First Church and the Punch-bowl National Cemetery. From the inter-island terminal, you'll board your plane for the return flight. A light breakfast and Pearl Harbor lunch is included in this package + One complimentary gift of Pearl Harbor 75th anniversary of the attack "mug" per reservation. After the tour, hop back in the car for a complimentary short Honolulu city tour. Visit sites such as Iolani Palace, Washington Place, the statue of King Kamehameha, the Hawaii State Capitol building and Punch-bowl National Cemetery.